to present Cinema en Plein air, a French outdoor movie. Four recent movies will be shown in May, bringing to Filipino viewers some of the best family films from France with English subtitles. 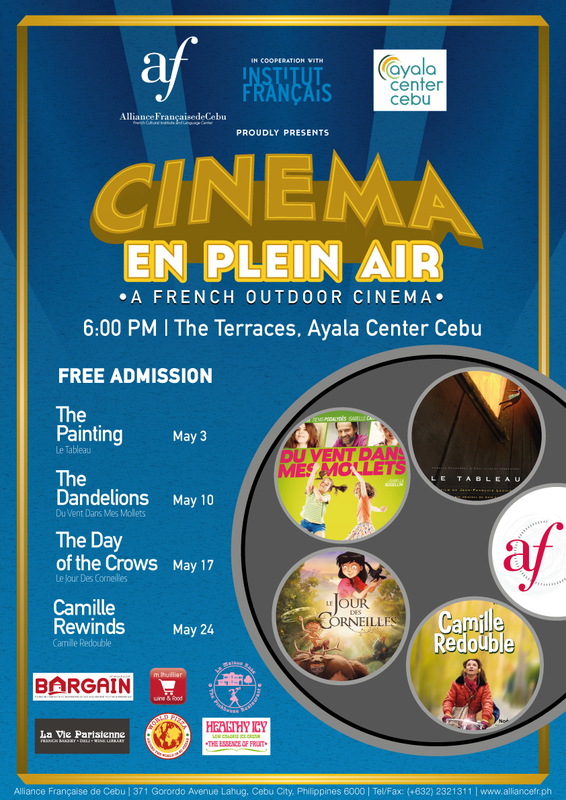 Cinema en Plein Air will be held every Saturday of May at 6:00 PM at the Ayala Center Terraces. First projection on May 3rd. ANNNND Admission is FREE!!! entirely painted characters take over the Chateau and chase the others. To restore the harmony, Ramo, Lola and Plume decide to look for the painter. day know the Painter's secret? Stuck between her parents, who smother her with love, and constant blunders, nineyear-old Rachel counts the minutes separating her from freedom. Until the day her path crosses that of intrepid Valérie. Camille was sixteen years-old when she met Eric. They fell madly in love and had a daughter. 25 years later: Eric is leaving Camille for a younger woman. That’s New Year’s Eve, and Camille suddenly finds herself back in her past. She is sixteen again and has returned to her parents, her girlfriends, her childhood… and Eric. Will she flee and try to change the course of their lives? What are you waiting for? Admission is FREE!! !